Having to post bail for a loved one generally isn't on a daily to-do list. It's often a spur of the moment task that occurs soon after receiving a call from someone you care about saying that they have been arrested. You'll likely want to act quickly to help get them out of that jail cell, no matter what time of the day it is. The following informs you how to go about getting a bail bond after normal business hours or late at night. Why would I need a bail bond late at night? Many arrests don't occur during the normal 9 to 5 grind. Whether a person is arrested for a DUI or on more heinous charges, it is likely that instance occurred a little later on the clock. In order to get a person out of lock up as soon as possible it is necessary to begin the bail bond process right away. This generally means finding a bail bond agency right after the defendant called you from jail. It more than likely won't be difficult to find a bail bond agency that offers 24 hour bail services, as most of them do. So it is important to make sure that they offer a few other qualities as well. They should advertise low rates, flexible payment plans, and that they're licensed and insured. There are generally a few ways to contact a bail agency after normal working hours in order to get a night time bail bond. The quickest way to get a bail bond late at night is to contact a bail agency by phone. Some may have a separate 24 hour phone number. Either way, this will put you in direct contact with a bail agent who can begin the bail process. The other option is to fill out a bail bond request form that is usually located on the bail agency's website. This will be emailed directly to a bail bondsman who will contact you as soon as they get it. It may not be as fast as a phone call, but it is a convenient option to have. Once you touch base with a bail bonds agent they will walk you through the next steps to get your loved one released fast. 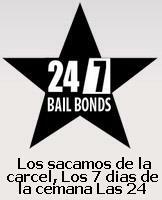 For a 24/7 bail bond in San Rafael, CA, or throughout Marin County don't hesitate to contact 5 Star Bail Bonds. Our team offers fast, friendly and affordable bail bond service. Give us a call day or night at (415) 479-4800 to post bail in Marin County, California.